When Toyota began selling the RAV4 in May 1994 (in Japan only), sales nearly doubled initial estimates, with 8,000 orders in the first month. The Toyota RAV4’s introduction to the United States in 1996 fueled an industry-wide rush to develop car-based crossovers that were smaller, sportier, and less off-road-oriented than the unit-bodied, 1984-vintage Cherokee. The RAV4’s success was due partly to its convenient size and partly to its thrift. It used the second-generation Camry’s 2-liter four-cylinder engine, and was sold in both two and four door versions, with a manual five-speed transmission and a four-speed stick; full-time all wheel drive was standard, with an optional locking center differential. The package could handle minor off-roading, but was meant as an on-road package, and came with full passenger-car safety equipment (including, from the start, dual airbags). The relatively compact size, passenger-car interior and safety, and on-road-oriented design, coupled with the ability to go off-road if needed, created a new market niche. In 1997, new seat fabric was used in the two-doors, a power moonroof was made optional in four-doors, a digital clock was added, and models with power windows were given bigger front speakers. In 1998, there were a variety of exterior changes, including the grille and tail, and, inside, dual cupholders, a new steering wheel, audio upgrades, seat fabric on four-doors, a digital odometer, and new door panels. In 1999, a convertible version, the Soft Top, was added to the lineup; the two-door Soft Top had a front hard top combined with a rear convertible soft top, with braces in the rocker panels and rear fenders to keep the body together in the absence of a full roof. The top, made in the US, was made of double-layered, vinyl-coated polyester with a two-ply substrate and plastic windows. The top was kink and wrinkle resistant, and was designed to channel water away from the cabin in rain. The Soft Top proved to be less successful than hoped, and never made it to the 2000 model year. Another 1999 model was the RAV-4L special edition, with a leather interior and color-keyed body cladding, mirrors, and door handles. In 2001, the RAV-4 was redesigned (see the following section) with many changes. In 2003, a Sport Package was added, with additional amenities and exterior appearance changes. 2004 saw a number of appearance changes, including the back door handle, front bumper, headlights and grille, fog and tail lights, and spare tire cover. Perhaps more significant, a 2.4 liter engine replaced the 2.0 liter Camry four; the new 2.4 liter engine produced 161 horsepower and 162 lb-ft of torque. Partly in response to feelings of instability, the RAV4 was given standard vehicle stability control, including traction control, brake assist, antilock brakes, and electronic brake-force distribution, as standard features. First and second row side curtain airbags and front side airbags were added as options. The RAV4 is made in the Motomachi Plant in Toyota City, Japan. The 2006 Toyota RAV-4: 0 to 60 in 7 seconds! The 2006 model brings a larger size, new styling, and, most exciting for many people, the Toyota 3.5 liter V6 for stunning performance. The 2006 RAV4 has three different grades, available in two and four wheel drive; the grades are standard, Sport, and Limited. All are available with the five-speed automatic and 3.5 V6, producing a stunning 269 horsepower and 246 lb-ft of torque, for zero to sixty in under seven seconds — despite EPA gas mileage ratings of 22 city, 29 highway (21/28 for 4x4). The V6 manages this through dual variable valve timing, and achieves peak horsepower at 6,200 rpm and peak torque at 4,700 rpm. Toyota developed many technological improvements for the new V6, including the introduction of a unique new roller rocker concave cam profile that provides faster opening and later closing of the valves, which is a key contributor to its significant power. In addition, the dual-VVT-i system optimizes intake and exhaust valve timing to increase high-speed torque, ultimately improving fuel economy. The standard powertrain is a 2.4-liter four-cylinder engine with VVT-i equipped with a gated-shift four-speed automatic. The engine delivers 166 horsepower (an increase of five hp) with 165 lbs.-ft of torque @ 4,000 RPM, making it one of the most powerful four-cylinder engines in the small SUV segment. Gas mileage for the four-cylinder is 24 city, 29 highway (23/27 for 4x4s) according to the EPA. Both the V6 and four-cylinder engines are EPA certified as Ultra Low Emission Vehicle II (ULEV2). The aerodynamic shape of the RAV4 reduces its coefficient of drag from 0.35 to 0.33, among the best in its segment and very good even by car standards; this lowers wind noise and fuel use. The RAV4 helps protect its occupants with a reinforced cabin using front and rear crumple zones and energy-absorbing materials on the roof and doors to help reduce the severity of head, chest and abdominal injuries in the event of an accident. Like all Toyota SUVs, RAV4 comes standard with the Star Safety System. The standard system includes vehicle stability control (VSC), Traction Control (TRAC), anti-lock brake system (ABS) with Electronic Brake-force Distribution (EBD) and Brake Assist (BA). The new RAV4 adds to the Star Safety System with the addition of all-new enhancements to VSC. This new system goes beyond conventional traction and stability controls that simply react to challenging conditions; fast-reaction LED tail-lamps add to the system. VSC now interfaces with a new Electronic Power Steering system (EPS) to help optimize steering assist for each situation. The EPS uses a DC motor and gear reduction system built into the steering gear housing; this compact unit contributes to fuel economy by eliminating the pump and by providing assist only when called for by the driver. EPS also allows a more precise and timely control of steering assist than conventional engine-driven hydraulic systems. The integration of EPS allows the enhanced VSC system to better anticipate vehicle lack of control in virtually any direction and correspond to driver operation and vehicle behavior. All RAV4s equipped with a V6 engine and all four-cylinder models equipped with a third-row seat come standard with Hill-start Assist Control (HAC) and Downhill Assist Control (DAC). HAC provides additional control for on-road and off-road driving by helping to keep the vehicle stationary while starting on a steep incline or slippery surface. DAC is designed to augment the low-speed descending ability of low-range by helping to hold the vehicle to a target speed with no intervention from the driver. Uphill/downhill shift logic is used on all automatic transmissions to reduces the frequency of gear shifting. Ride and handling are further enhanced with a new electronically controlled on-demand four-wheel-drive system with an electronic controlled coupling that distributes torque between the front and rear wheels, allowing the RAV4 to switch continuously from front-wheel-drive to four-wheel-drive mode, increasing vehicle control and fuel economy. When in auto mode, torque distribution to the rear wheels is decreased during low speed cornering to avoid tight corner braking. A manual locking switch disengages the auto mode, maximizing torque distribution to the rear wheels. When the vehicle speed reaches 25 mph the Lock mode will disengage, reverting back to Auto mode. The Lock mode also disengages when the brakes are engaged, optimizing ABS and VSC. 4x2 models now have an automatic limited slip differential as standard equipment. The new RAV4 is constructed with high-tensile steel, creating a lightweight yet rigid body for enhanced driving stability and responsive steering. New engine hood seals, a two-ply hood insulator with middle air layer, and a cowl front insulator reduce noise and vibration, while wind noise has been reduced by eliminating the outer molding from the windshield and door glass. With an increased length of more than 14 inches over the previous generation, a new seating design features second row seating for three and optional third row seating, a first in the small SUV segment. The larger dimensions create a larger cabin, increasing shoulder room for all passengers, and additional head clearance and legroom for second row passengers, allowing for overall greater passenger comfort. The spare tire is mounted in a partial-hard color-keyed shell, increasing interior space. All three grades (Base, Sport, and Limited) include air-conditioning, AM/FM CD with six speakers with a mini-plug jack and MP3/WMA playback capability, remote keyless entry, ten front and rear bottle/cup holders, power windows and door locks, larger foldable power mirrors, privacy glass, three 12-volt auxiliary power outlets, and a tilt and telescopic steering wheel. RAV4 also features the first in-use application of lever-operated brake deceleration cruise control as standard equipment. The front suspension is equipped with McPherson struts, which have been completely redesigned from the lower arm, to the coil springs and shock absorbers. The rear utilizes a newly developed, trailing double wishbone suspension. The rear shock absorbers are uniquely positioned diagonally allowing for a larger and lower rear cargo deck. The new Sport grade adds P235/55 R18 tires with 18-inch aluminum alloy wheels, sport tuned suspension, color-keyed door handles, fender flares, fog lights, roof rails and cross bars, color-keyed heated and foldable power outside mirrors, smoked headlamp trim, unique dark charcoal fabric seats, and color-keyed spare tire cover. Folding seats in nearly all positions and under-floor storage (on models without the vestigial third-row seat) provide surprising cargo space. Second row seats are 60/40 split with fore and aft movement for legroom adjustment, reclining seatbacks for added comfort and an armrest with two cupholders. The second row seats fold flat with the convenience of tilt-down levers located on the side of the seatbacks and cargo area, allowing for an even and expanded rear cargo area. A second one-touch lever, located in the cargo area, also allows the second-row seats (on two-row models) to fold flat. The optional 50/50 split and stow third-row seat on Base and Limited grades allow seating for two passengers, and folds flat under the rear deck for increased cargo space. Durable fabric seats add to the interior comfort of the Base grade. An upgraded seat fabric is also standard on the Limited grade and leather-trimmed seats are offered on the Limited grade. A drivers seat ratchet device on non-Limited models allows for easy seat-height adjustment. 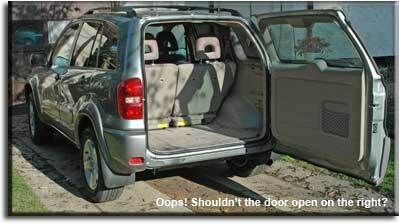 Storage is in abundance with compartments on each of the front doors, increased storage capacity in the center console box, rear passenger storage on the front driver and passenger seatbacks, a back door storage pocket, a sunken rear storage compartment with a foldable double-flap lid, and a one-push open/close upper storage compartment above the glove box. Two hidden storage compartments are concealed under the rear cargo area floor by a water-repellant foldable deck board on models equipped with two-rows. All three grades get air-conditioning, AM/FM CD with six speakers with a mini-plug jack and MP3/WMA playback capability, remote keyless entry, ten front and rear bottle/cup holders, power windows and door locks, larger foldable power mirrors, three 12-volt auxiliary power outlets, and a tilt and telescopic steering wheel. RAV4 also features the first in-use application of lever-operated brake deceleration cruise control as standard equipment. The Limited grade adds a higher level of refinement with standard features, inside and out, that include P225/65 R17 tires with 17-inch aluminum six-spoke alloy wheels, color-keyed door handles, fog lights, black roof rails and cross bars, color-keyed heated and foldable power side mirrors, AM/FM six-disc in-dash CD changer with six speakers, a mini-plug jack and MP3/WMA playback capability, defroster-linked CFC-free dual zone automatic climate control with air filter, micro dust/pollen removal capability and information display, engine immobilizer system, interior foot-well lighting, leather-wrapped steering wheel with audio controls, leather-wrapped shift knob with metallic insert, eight-way power driver seat plus lumbar, privacy glass, cargo area tonneau cover with a multi-purpose cargo net and support poles (models with two-rows only), hard shell color-keyed spare tire cover, upgraded seat fabric, and a chrome grille. The RAV4 was redesigned completely for the 2001 model year, with length, width, height, and wheelbase all increased by at least one inch. The 2001 RAV4’s exterior has been completely redesigned by Calty, Toyota’s design center in Newport Beach, Calif., for a more aerodynamic, aggressive appearance. The thick hood and front combination lights with multi-reflectors lamps express a definite presence of an SUV. The arched roofline leads to a spoiler-shaped roof end that creates a side profile with an innovative look. Rear combination lights wrap around the sides and provide a rear view that portrays stability as well as more visibility to surrounding traffic. Overfenders and integrated fog lamps are optional equipment. The 2001 RAV4 was powered by a new, all-aluminum 2.0 liter, four-cylinder engine with Variable Valve Timing with Intelligence technology (VVT-i). The engine produces 148 horsepower at 6,000 rpm and 142 ft./lb. of torque at 4,000 rpm, delivering 21 more horsepower and 10 more foot pounds of torque over the previous generation. The engine weighs approximately 40 pounds less than the previous engine. RAV4 is available in both front and full-time four-wheel drive. A five-speed manual overdrive transmission is standard equipment. A four-speed electronically controlled automatic transmission (ECT) also is available. All transmissions have transmission coolers; an air-cooled system complements the five-speed manual and water-cooled systems accompany the four-speed automatics. The RAV4 sits on front independent MacPherson struts with L-shaped control arms and stabilizer bar. The rear suspension features a double wishbone coil spring independent suspension with trailing arms and low-pressure nitrogen-filled shock absorbers and stabilizer bar. Softer spring rates, larger bushings, and longer suspension stroke all improve overall ride quality. Steering feel and response have been heightened by RAV4’s rack and pinion power steering. A wheelbase of 98.0 inches contributes to a comfortable ride as well as an abundance of rear seat legroom. The all-new RAV4 has 10.7-inch front ventilated disc brakes with 9.0-inch rear drums. A four-wheel anti-lock braking system (ABS) with electronic brake force distribution (EBD) also is available. ABS with EBD adjusts the braking force of the rear wheels in accordance with the load fluctuations, thereby assisting braking performance in different driving conditions. Safety features include three-point automatic and emergency locking retractor belts on all passener seats (the driver only gets emergency locking), front seat belts with pretensioners and force-limiters, and, on optional power windows, auto up/down with pinch protection on the driver’s side window. An immobilizer that enhances the vehicle’s theft deterrence performance is available. Seat construction incorporates the Whiplash Injury Lessening (WIL) concept. The interior of the 2001 RAV4 was more spacious, offering 42.4- and 32.6-inches of front and rear legroom, respectively. The redesigned passenger cabin with 41.3 inches of front headroom allows for easy ingress and egress. There are more seating configurations for comfort and convenience. There is ample room for five passengers and increased cargo volume of 29.2 cubic feet. The 50/50 split bench rear seats have a slide, tumble, recline and removable feature for 68.3 cubic feet of cargo space. Available equipment includes four-wheel anti-lock brakes, daytime running lights, air conditioning, cruise control, power windows, power door locks, power moonroof, privacy glass, roof rack, rear spoiler, keyless entry, split 5-spoke alloy wheels and 5-spoke alloy wheels with larger tires. Interior Cargo Volume: 29.2 cu ft behind rear seats; 68.3 cu ft without any seats. An electric version of the standard RAV4, the RAV4 EV was offered only by lease to fleet users, mainly as a way to get information on durability and usability. Fleet users tend to drive more miles and can have electric vehicle infrastructures that civilians are unlikely to have. In 1999, 255 RAV4-EVs were delivered. Standard on all RAV4-EVs were split fold-down rear seats, dual airbags, adjustable-height front seatbelt anchors, heated windshield, rear-window wiper and defogger, heated driver and front-passenger seats, alloy wheels, power-operated side mirrors, windows and door locks and a heat-pump type air conditioner with timer and pre-heat/pre-cool settings. Rear-seat heaters, a heavy-duty heat pump and traction control are available as options in cold climates. The RAV4-EV was powered by a maintenance-free permanent magnet motor producing 50kW of power (equivalent to a 67-horsepower gasoline engine) from 3,100-4,600 rpm and 190Nm of torque (approximately 140 lb./ft.) from 0-1,500 rpm. Since an electric motor produces peak torque immediately off of idle, the RAV4-EV accelerates well from a standing start, with a zero-to-60 mph performance of about 18 seconds (vs 11 or so for a gas engine) and an electronically managed top speed of 78 mph. The motor drives the front wheels through a single speed transaxle. Rotating the motor backwards activates reverse gear. Energy storage is provided by a sealed, maintenance-free nickel-metal hydride (NiMH) battery pack. Comprised of 24 individual 12-volt modules, the pack produces 288 volts. To achieve a low center of gravity and minimize intrusion into the passenger compartment, the NiMH battery pack is located under the floor. An inductive charging system has been adopted for 1999 and later RAV4-EVs, allowing relocation of the main charging components from the vehicle to an external charger, reducing vehicle weight and complexity. Full re-charging takes about five to six hours and provides an approximate maximum driving range of 126 miles. In most “real-world” driving conditions, however, actual range will be about 100 miles. The RAV4 EV braking system features solid aluminum front discs, steel rear drums, integral anti-lock system (ABS) and a sophisticated regenerative system which returns energy to the batteries when the vehicle is coasting or braking. Efficiency of this system extends the vehicle’s operating range to approximately 25 percent more in city driving than on the highway, when the brakes are not used as frequently.